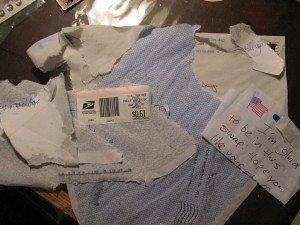 If you have a wet mail problem, you know what it’s like to go to the mailbox, open the door, and there lies a pile of floppy, squishy paper that used to be your mail. The envelopes are wrinkled, the ink is smeared, and it’s just dripping wet. Then you try to open it so that it will dry out faster, but in so doing the paper tears and pulls apart making the mess worse.